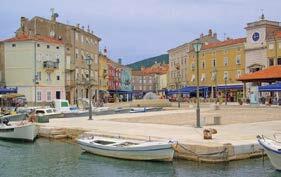 A station of Croatia cruise route R1 is the port of Mali Lošinj on its namesake island Lošinj. We continue to the south. 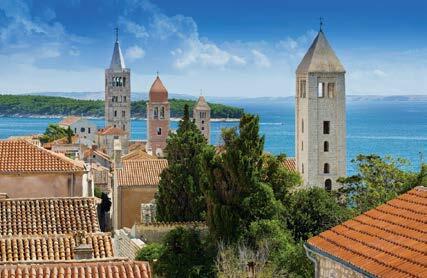 Our today’s destination is the island of Dugi Otok. 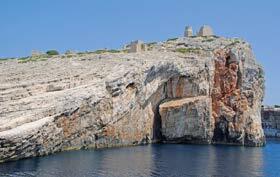 Dugi Otok, which means “Long Island”, is named after its shape – it is 45 km long and only a few hundred metres wide. The majority of the islanders live and work in Zadar, therefore in low tourist season it is very quiet on the island locations, while you can expect typical Mediterranean bustle on weekends, when the locals return to their hometowns. Before entering one of the island’s ports for our overnight stay, we will anchor in one of the many coves, to take a refreshing swim. Surely the highlight of our trip! According to the Irish author George Bernard Shaw (who received the Nobel Prize in Literature in 1925), ”On the last day of creation, God crowned his work, and thus created, out of tears, stars and breath, the Kornati Islands”. The beautiful scenery, countless small and large islands (according to local lore “an island for every day of the year”), and the beau- tiful sea – all this makes the Kornati Islands a unique paradise. It is the largest and most dense archipelago in the Adriatic Sea – it comprises 147 islands, islets and reefs, with a total area of 69 km 2 , spread over 230 km 2 . They cover an area of 35 km of length and 13 km of width among the islands of Dugi Otok in the north-west, Žirje in the southeast, and Pašman, Vrgada and Murter in the north and northeast. From Sali we will head towards the “Proversa”, a narrow passage between the islands of Dugi Otok and Kornat, which is the entrance to the unique National Park. Passing countless, mostly uninhabited, islets we will reach the island of Mana, which on one side gently slopes into the sea, while on the other side it is marked by high cliffs. The ruins at the highest point of the island are not remains of historic times, but scenes of the movie “As the Sea Rages”, filmed here in the late 1950s, starring Maria Schell. In the afternoon, we will cruise towards north and anchor in one of the fishing villages of the Zadar archipelago – Dragove, Zverinac, Ist, or Molat. 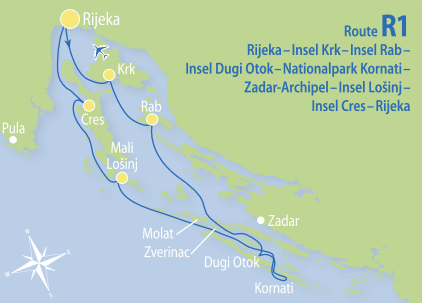 Today we will sail to the neighbouring island of Cres, which is connected to Lošinj by a pivot bridge in Osor. The striking feature of the island are the endless olive groves and the innumerable flocks of sheep. Need - less to say, that roast lamb is one of the specialties of the island of Cres. After the obligatory swimming break, we will head towards the picturesque town of Cres, where we will stay for the night. Time to say goodbye to the Croatian islands: from Cres we will cruise along the eastern shoreline of Istria to Rijeka – not without taking one last dip into the sea. 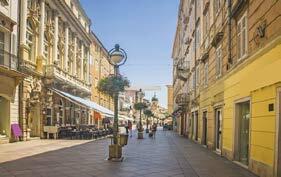 Overnight stay in the port of Rijeka.